First up: I’m blown away by how successful our users have been with Pavlok. From Waking up early, to quitting smoking, to getting over negative thoughts, and more — it’s crazy how effective a little positive and negative reinforcement can be. But it always surprises me how few people know all of the capabilities of Pavlok. We’ve been building APPS, HABITS, INTEGRATIONS, even GAMES, all utilizing the Pavlok hardware, to bring information into the physical real. All with the mindset of — we don’t just help you achieve your goals — we get you to achieve your goals. And one of the most fundamental goals that Pavlok users have is to BE MORE PRODUCTIVE. Did you know that Pavlok has a Chrome Extension that helps you stop wasting time online? It’s one of our most popular integrations (>4 stars) with thousands of users — AND YOU DON’T EVEN NEED A PAVLOK TO USE IT. 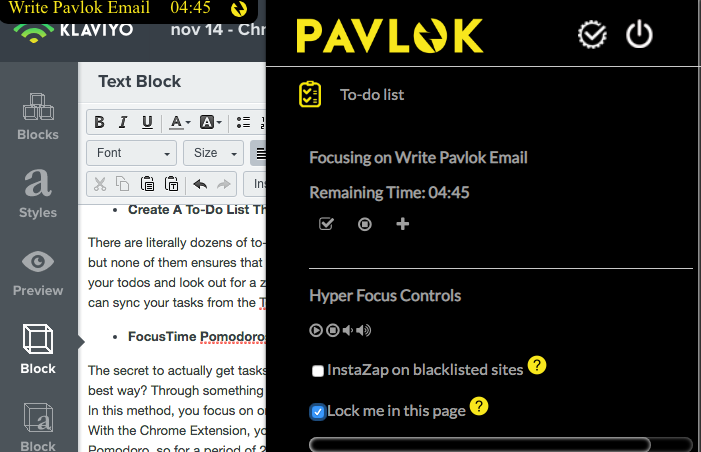 So today, I wanted to showcase the Pavlok Productivity Chrome Extension. Last week we shared the incredible story of how Pavlok user Chris N, used Pavlok to improve his productivity and write more on a consistent basis. 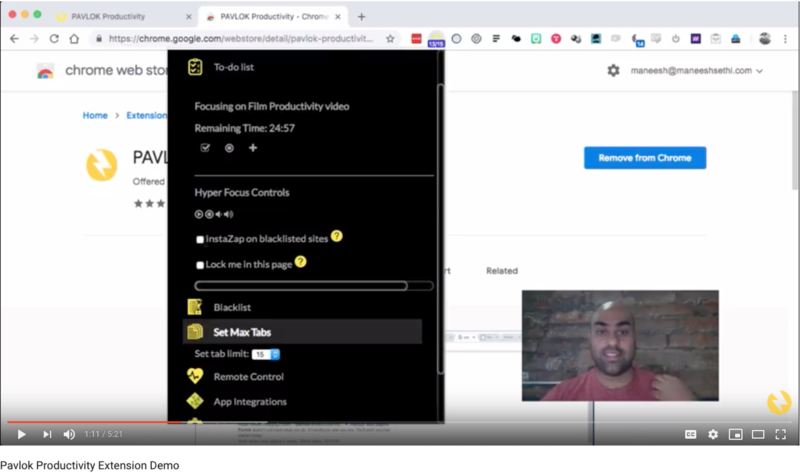 Many of you reached out asking about all the ways you can use the Pavlok Chrome extension to get more done and stay on track automatically. Today we wanted to share some of the key features briefly and why they are so powerful. The secret to actually get tasks done is simple: DO THEM. The best way? Through something known as the Pomodoro Technique. In this method, you focus on one task, exclusively for 25 mins. With the Chrome Extension, you can associate your tasks with a Pomodoro, so for a period of 25 mins you’ll be reminded, vibrated, and buzzed to stay on task for one task! The task hovers over all your browser windows to make sure you don’t forget. Add your typical list of most distracting sites and have your Pavlok keep you in check. You’ll think twice about checking Twitter if you know zap is on its way. It’s virtually impossible to get things done when you have more tabs open than you can count. Get close to your tab limit? Vibration warning. Reach the limit? Beep. Go over? ZAP. Now I never open more than my limit, ever. RescueTime integration, Todoist integration, Whitelisting, etc etc — there’s plenty more. The extension has a ton of additional customizations and tweaks depending on your specific goals, and we’re always adding more! If you haven’t yet installed the Chrome Extension, download it today and give it a try! P.S. You can use the extension without a Pavlok, but you’ll need the device if you want to feel the vibrations, beeps, and zaps. Click Here to order your Pavlok 2. Don’t wait — we are already out of stock for November, and we only have 3000 in stock for December. Order Now if you want it before Xmas!